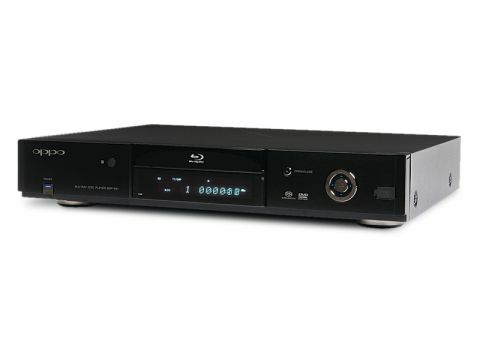 The brand Oppo has already made a splash in the DVD market with a range of feature-packed, high performance players, but now it turns its hand to Blu-ray with the BDP-831. This debut deck has been well received Stateside (where it's called the BDP-83), so it's one of our most highly anticipated players of the year. The BDP-831 is much heavier than a budget player, and the rigid casing comes in an understated, but utterly classy, gunmetal grey finish. Only a few buttons pepper the fascia, which adds to its allure. But it's on the inside where the fun really starts. At the player's core is Anchor Bay's Video Reference Series (VRS) picture technology, which does all the video donkey work such as de-interlacing, upscaling and detail enhancement. As you'd expect, the deck is BD Live compatible and as such comes equipped with an Ethernet port on the rear and 1GB of built-in storage, which is always welcome. If you manage to fill that up, you can add more memory by plugging a larger USB drive into the back. Wi-Fi support would have been the icing on the cake, but with so much crammed in elsewhere it's churlish to complain. Another distinctive feature is DVD-Audio and SACD playback, making this the most affordable 'universal' Blu-ray deck to date. It's backed up by a full complement of HD audio tools, including on-board decoding of Dolby True HD and DTS HD Master Audio, which can be output as PCM via the HDMI or from the rear-mounted set of 7.1-channel analogue sockets. The BDP-831 boasts a long list of compatible formats and two USB ports to play them from, but our sample only played WMA files from USB sticks or data discs, not MP3 files. We understand that Oppo will be updating the player with this functionality before it goes on sale. Fiddling around in the setup menu, this is clearly a player aimed at those who take image and sound quality very seriously. The Picture Preferences menu, for example, boasts nine different configurable parameters, while on the audio side you can tweak the settings for each individual speaker and select various options for SACD and DVD-A playback. There's even a range of useful zoom modes (including a decent vertical stretch setting for removing the black bars from 2.35:1 material) and a Source Direct mode that outputs the signal exactly as it's found on the disc with no processing or alteration. Oppo's easy-to-use menu system is beautifully presented with modern fonts, colourful graphics and a logical structure. The onscreen banners during playback are filled with useful information, including the current AV formats and bitrates. It's simple to control with the large remote, which is packed with chunky buttons, but keeps confusion at bay with clear labelling and intuitive placement. Its coup de grâce is the backlight that helps you to find the right keys in the dark. As for disc loading, the BDP-831 is the fastest player we've tested. It reached the Sony Pictures logo of the Spider-Man 3 disc in 29 seconds, and less tricky discs take around 15 seconds, rehabilitating Blu-ray's reputation as a slow-loading format. With all that high-powered picture talent on board, it would be criminal if the BDP-831 offered anything less than top-drawer images. Thankfully, it's a masterful performer with both Blu-ray and DVDs.